Designing a unique experience for one of the world’s most event-savvy audiences, while accommodating an expansive agenda in a new venue. 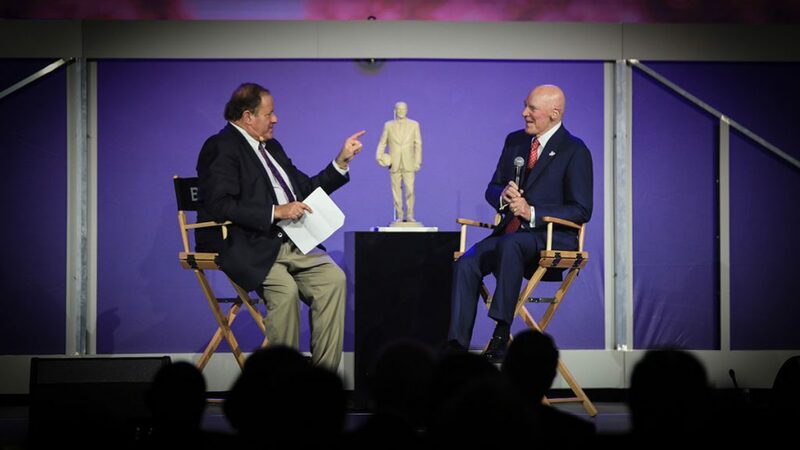 In 2015, more than a year in advance of Super Bowl LI, the Houston Super Bowl Host Committee began planning for the Luminaries of the Game Super Bowl Gala, the kick-off event for Super Bowl week and an opportunity to raise money for local charities while honoring NFL Texans owner Robert McNair in a 3-hour program. 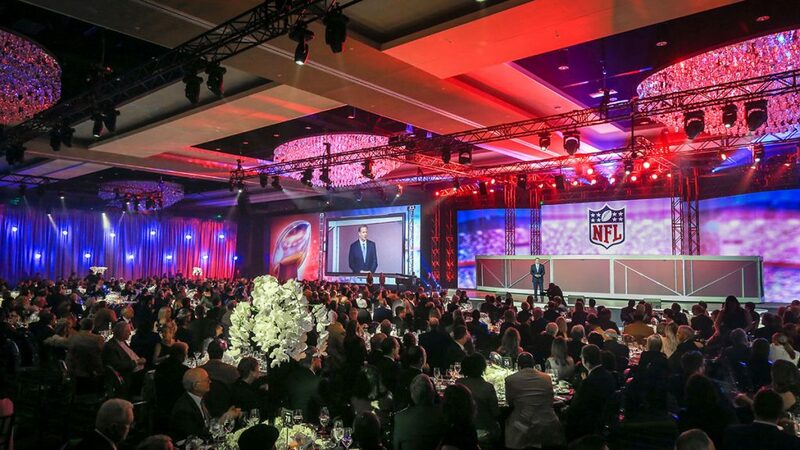 Staging Solutions worked with the HSBHC to design a Super Bowl Gala experience that would not only dazzle those in attendance, but would also accomplish a variety of goals set out for the evening. 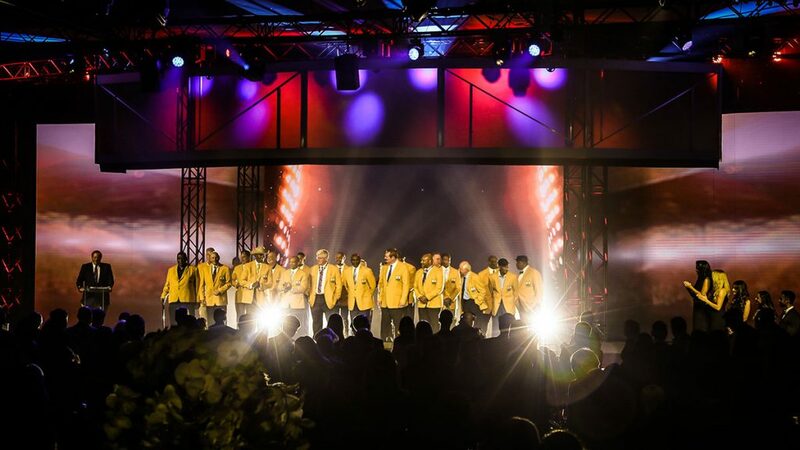 The most important being to celebrate the contributions of Robert McNair and presenting him with various accolades, honoring a large group of Pro Football Hall of Famers, showcasing the talented performance group, Naturally 7, as well as the set the stage for high-profile guests and speakers. A further challenge was designing the inaugural event in a venue that was under construction during the planning process: the new Marriott Marquis’s Texas Ballroom. 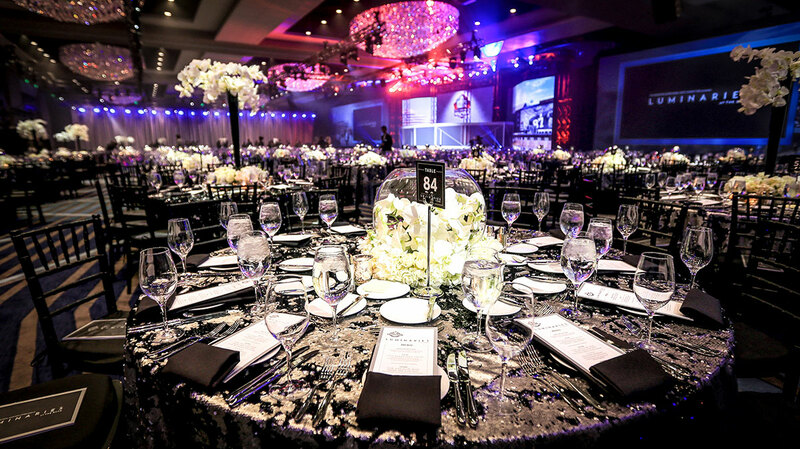 Staging’s creative team worked cooperatively with event designers, building development staff, the HSBHC, and our own internal resources to craft an event that accomplished its goal of being the talk of the town while raising a jaw-dropping one million dollars to benefit 78 local charities. Working in cooperation with Richard Flowers of The Events Company and Joel Baker, Staging Solutions conceptualized, designed, and built the scenic layout of the Texas Ballroom to include an 18’x80’ LED screen, along with two 20’x60’ screens, to display a video field 216,000 x 1080 pixels. This backdrop hosted media content developed by Staging Solutions’ Media Department, featuring over 200 visuals in support of the evening’s program and a tribute video for honorees Janice and Robert McNair. Included in the set design was a stage featuring an epic 30’-wide arch that was gracefully raised and lowered throughout the evening’s program. Various configurations created moments revealing a bust of Robert McNair, a dozen Pro Football Hall of Famers, and an ESPN broadcast-style sports desk for Chris Berman to host on-stage interviews with luminaries including Earl Campbell. 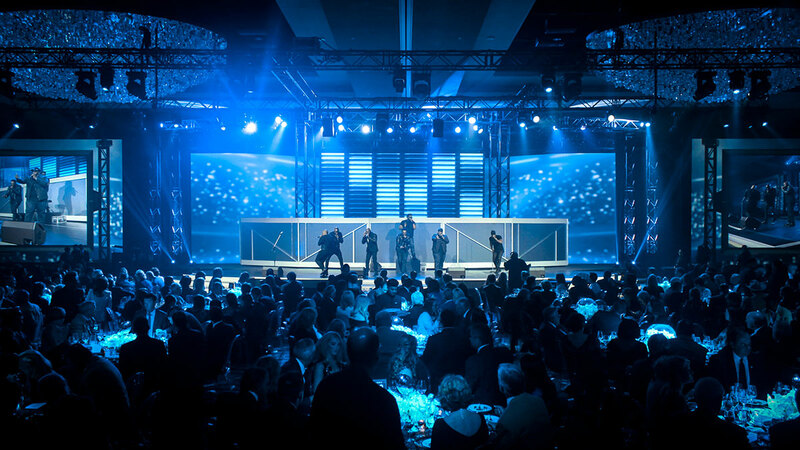 Custom-designed, football-shaped lights around the perimeter of the Ballroom were programmed to dance to Naturally 7’s performance, rising and falling in time to the music to the delight of the audience. Among the evening’s honored guests were NFL Commissioner Roger Goodell, Houston Mayor Sylvester Turner, Houston legends Yao Ming, Dikembe Mutombo, and Andre Johnson, the McNairs, event co-chairs Lynn Wyatt and James A. Baker, III, 52 members of the Pro Football Hall of Fame, the Houston Super Bowl Host Committee, and an A-list of Houston’s bold-faced names. A happy client. Staging Solutions received accolades from HSBHC CEO Sallie Sargent, the event’s executive producer Nance Weenick, as well as high praise from guests and media covering the event. HSBHC raised $1 million to assist 78 local charities. Event co-chair Lynn Wyatt quipped from the stage, “We’re going to rename this room ‘the million-dollar room,’” referring to the funds raised at the event, and Staging is happy to assist. Guests who attended the event were highly impressed. Those planning an event in the Marriott Marquis Texas Ballroom are inviting us to collaborate with them. Bring it on! 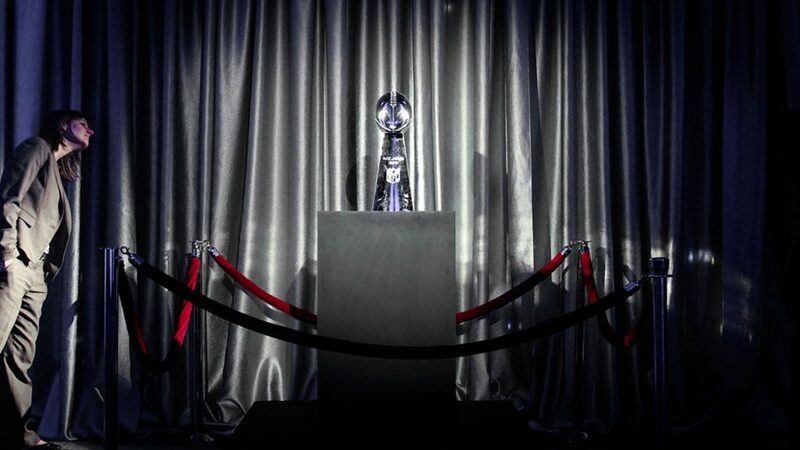 It is a special night at @TheMarquisHOU!